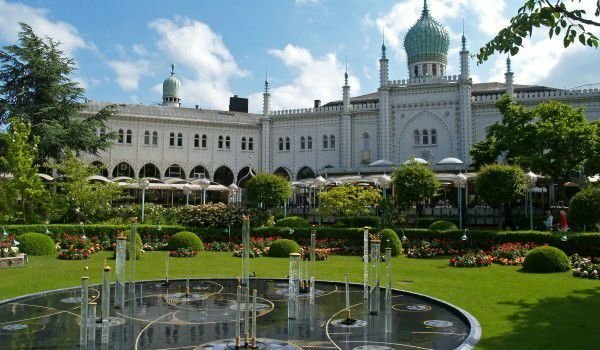 Tivoli Gardens is the most famous amusement park in Denmark and perhaps the most visited tourist attraction in the country. Leisure facilities, known as the garden of pleasures, are built on the former site of the fortification wall surrounding the capital of Denmark - Copenhagen. Today, the fun-fair is located near Copenhagen City Hall. Built back in 1843 the park opened on August 15, making it the oldest amusement park in Europe, and the second oldest in the world, after Dyrehavsbakken. 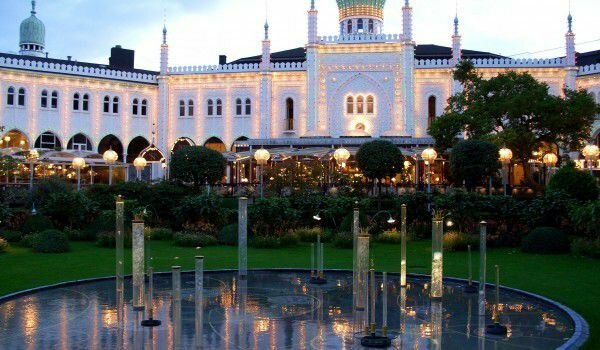 Tivoli is the most visited entertainment center in Scandinavia, and ranks third in attendance in Europe. In the mid 19th century, King Christian VIII ordered the construction of the park, and chose the artist Georg Carstensen as the executor of the order. Perhaps driven by his famous phrase, "That when people have fun, they are not moved by politics", the King laid the foundation with a small theater scene, several swings, roundabouts and a primitive-like train ride. Today Tivoli Gardens occupies an area of 82 717 square meters. Within the complex are 32 restaurants and 26 attractions. They are placed among the incredibly beautiful flower gardens. There are nearly 400 000 flower stalks arranged beautifully under old large trees form the pleasant paths, which have about five million tourists passing by each year. Restaurants and cafes in the park are among the oldest and most stylish restaurants all around Copenhagen. During the week, Tivoli’s doors are open until midnight and on Saturdays and Sundays you will find people there in the wee hours of the day. The location is attractive, not only for children but for adults. At night, thousands of lights illuminate the beautiful self- named lake as well as the amusement park. During the summer season and weekends there is often a light show with fireworks. In Tivoli Gardens there is a world famous concert hall and many smaller open-air stages, where different performances by both renowned theater companies, the various musical groups are on show. The biggest attraction here is probably the unique wooden roller Berg Bane, built back in 1914, which still operates today. Particularly attractive is the building of a pantomime theater, which was built entirely in typical Chinese style.